For Father’s Day, my wife decided to leave town for about a week. Wasn’t that generous of her? She left 4 beautiful angel children with me for a whole week. Crash Wife is so generous! I feel so lucky to have her make such sacrifices for me. 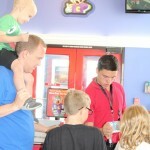 The good part is that Chuck E. Cheese’s is fine even with 4 kids. They have the person manning the door and so you can relax and enjoy the time together while the kids run all over. 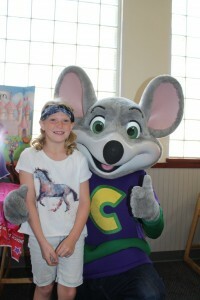 Chuck E. Cheese’s sent me a Father’s Day pass to be able to go and get some free pizza, drinks and tokens. 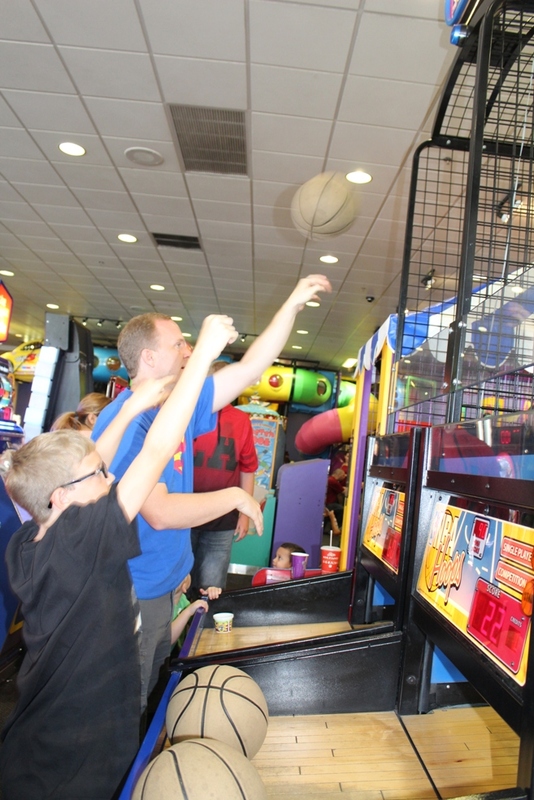 Plus, they gave me a challenge to teach my kids a lesson in skeeball and basketball. Ok, that’s not how they phrased it. They asked for us to go and have fun competing with our kids. Anyone who knows me understands that I’m hyper competitive and there’s only one person in the world where I don’t mind losing: Crash Wife. I’ll take it easy on the Crash Kids and I’ll make sure they have a good time, but I’ll also make sure I win. It’s just who I am and how I’m made. See what I mean in the picture above? 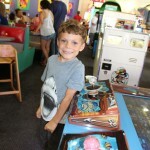 He certainly seems like he’s happy (even if I just smoked him in a game of skeeball). My favorite game though has to be the basketball shoot out. Luckily Crash Tennessee Aunt wasn’t there or I’d get smoked by her, but she was no where to be seen. However, I have to admit that Crash Kid #1 is starting to catch up with me. I’m sure a few years down the road he’ll read this post and laugh as he challenges me to a game of something. I figure I’ll just retire by that point. 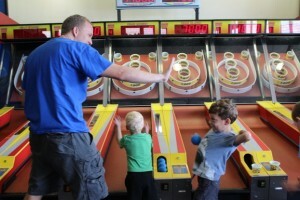 I also loved playing Skeeball with Crash Kid #4. 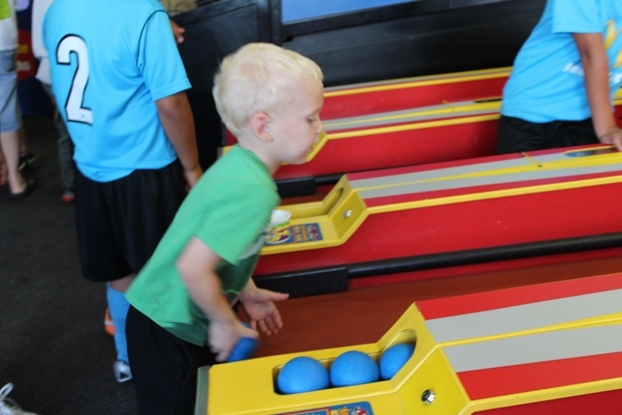 It’s so funny watching a 2 year old play skeeball. He can’t score any points since he can’t roll the ball hard enough to get up the ramp into the scoring area so our ticket collection suffers. However, he also gets a bunch of free rolls since half of his rolls don’t make it all the way up the ramp either and roll right back down to him. 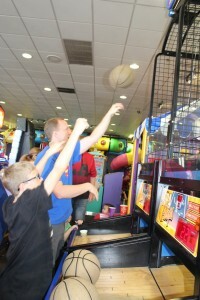 He has a great time even if it pulls at my heart to not score points on each ball. At least he’s cute doing it. 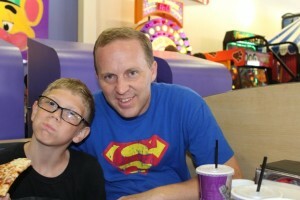 While the games were fun, I couldn’t help but let out a big belly laugh when Crash Kid #1 said the following as we were leaving, “I just have to say, that pizza was great!” In fact, he’s been raving about the delicious cheese pizza at Chuck E. Cheese’s ever since. This coming from the kid who doesn’t like to eat anything. 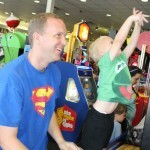 As part of Father’s Day, Chuck E. Cheese’s is giving dads a chance to win tickets to the 2015 Big Ball Game in Cincinnati (You know the one that can’t be mentioned). All you have to do to enter is to share images and stories about what you love most about being a dad using the hashtag #SuperDad. Plus, I think they’re giving away some free guest passes to Chuck E. Cheese’s as well. Here’s my entry with a picture of Crash Kid #3 making new friends that I tweeted out today. What a great day with the kids! 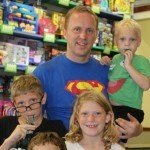 I even was a real Super Dad since I let Crash Kid #4 bring one of his friends with us as well. Nothing quite like being the cool dad who takes your kids’ friends fun places. While we were in NY visiting the in-laws, we were able to go to some children’s museum in Rochester (I think it’s called the Strong Museum of Play or something). 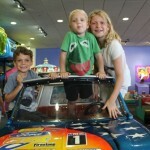 It’s a really cool place with a lot of fun things for the kids (and parents) to do. We all really enjoyed ourselves. One of the highlights of the museum for me was on the second floor where they had all these old school video and arcade games. It was awesome. On one computer, my son (Crash Kid #3) and I sat down and I started playing Sim City. Yes, the really old school Sim City. I remember countless hours playing it. Turns out, I still love the game and my son might love it even more. He’s asked a few times if we can play that game again. By shear coincidence, today I saw that the Web Archive (home to the awesome Wayback Machine) has started creating a library of MS-DOS based video games. The three that grabbed my attention were Oregon Trail, Bust-a-Move and of course Sim City. Pretty awesome and I love that their keeping a record of all these old school games and making them available for us to play. I’ll admit that I’m not a huge video game guy. I chose my marriage over video games, but that’s that story for another day. However, I do love to occasionally binge on a game or two. Most new games take too much time and attention to learn and enjoy. So, these old school video games are much better for some binge video game playing. 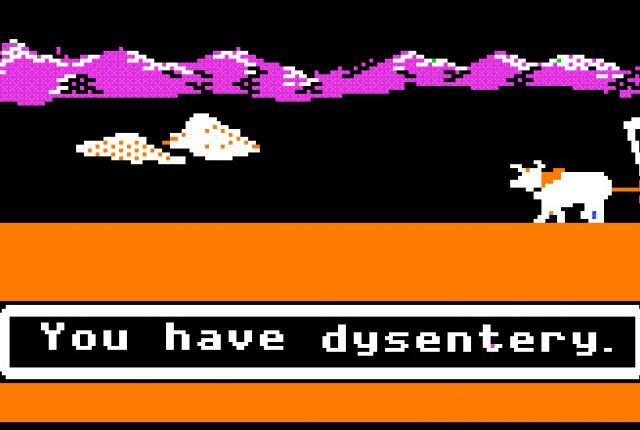 Plus, I love nostalgia and seeing games like Oregon Trail takes me back to elementary school. The problem in elementary school was that our computer time was never enough to actually complete the game. We’ll see if I have the time now.